Much better than Consecration, affecting board state immediately for high health minions while still can damage the other hero for large amount. I hate this card, used in every Druid deck because it is too powerful! The 1 damage AOE was never really good at clearing a ton of minions, except under specific conditions, like playing against a Murloc deck. The AOE is most useful for weakening minions to make more favorable trades and popping Divine Shields. This card is extremely useful for dealing cover damage to the opponent's side of the field. I find the Swipe Card to be really helpful when I'm trying to destroy my opponents minions. However, outside of that the Swipe Card is a little limited since it only has 1 Damage to all other enemies. 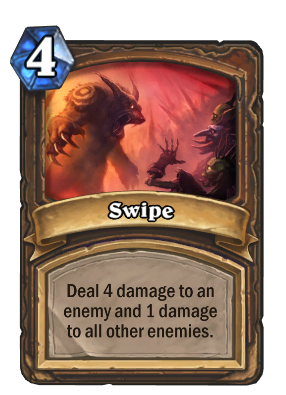 Side note, get more info on the card possibilities http://swipeapp.com. When I'm not using the Swipe Card to destroy my enemies minions I try using potions. Any good alternatives to Swipe? Swipe is faster than the speed of light,it is tachyonic,so it appears to be reversed. Very good to spawn more grim patrons,very good. Wow, how on earth could this card be only picked 15% of the time in arena rounds. This is the best Druid card by a long shot. Gained at level eight, gold version at 46 and 47. This card is granted at level 8. One of my favorite cards for the Druid, this card is extremely useful to clear an enemies minions. Not only does it almost guarantee at least one kill, but it also deals damage to your opponent's hero as well as all of his minions.